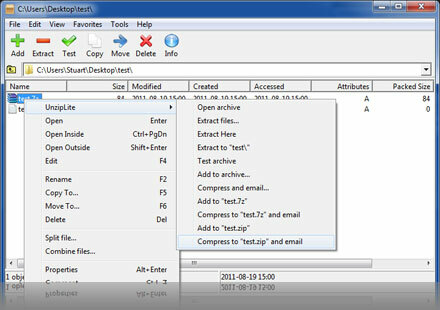 UnzipLite is a free compression and encryption program. You can Extract and open iso, rar, zip, tar, msi, cab, chm, rpm and more! UnzipLite can open ZIP files (unzip files) and it can also open RAR files (unrar files). The following file types can be uncompressed (or extracted): ZIP, RAR ,ARJ, BZIP2, CAB, CHM, CPIO, CramFS, DEB, DMG, FAT, GZIP, HFS, ISO, LZH, LZMA, MBR, MSI, NSIS, NTFS, RAR, RPM, SquashFS, TAR, UDF, VHD, WIM, XAR, XZ, 7z and Z. It also has the ability to create self-extracting files in the 7z fomat. The following file types are supported: ISO, RAR ,ARJ, BZIP2, CAB, CHM, CPIO, CramFS, DEB, DMG, FAT, GZIP, HFS, ZIP, LZH, LZMA, MBR, MSI, NSIS, NTFS, RAR, RPM, SquashFS, TAR, UDF, VHD, WIM, XAR, XZ, 7z and Z. You can extract MSI files, without running the installer. You can open ISO images without burning a CD. You can even convert CHM help files.